A satirical look at the current trajectory of the game industry. Open loot boxes, collect loot, equip cosmetics, face off against the dark lord, watch ads, take surveys, and slowly succumb to addiction. Hundreds of loot to collect: skins, boxes, accessories, skyboxes, and more! A suite of minigame experiences to explore! Tons of achievements to unlock! Ads to watch and surveys to take! and a story or something. Loot boxes are a popular form of monetization in video games. Similar to trading card packs, you have a chance of getting what you want when you open one. 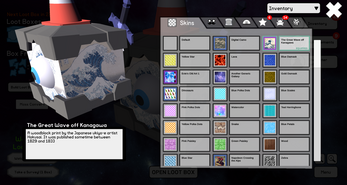 If a player runs out of boxes and still hasn’t gotten what they wanted, additional loot boxes are usually available for purchase. Almost every major game last year included them, blurring the line between games and gambling. Certain forms of loot boxes are now illegal in Belgium and the Netherlands. To stay up to date follow us on Twitter: @lootboxsim. For more on us check out our website.